Perfect for displaying and storing books. Place on a table or on the ground for little ones. Keep all of your story time favorites neatly organized and easily accessible while also storing toys and supplies! 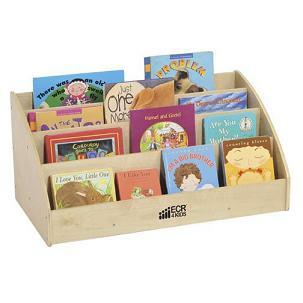 Four easy-to-reach book display shelves make this the ideal classroom storage solution. Solid birch construction with smooth edges and durable finish to compliment any classroom. The durable birch construction with beautiful natural finish is sure to fit in with any daycare or preschool environment.